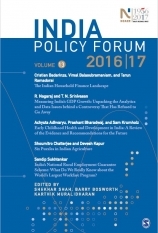 This 13th India Policy Forum 2016–17 Volume comprises papers and highlights of the discussions at the India Policy Forum (IPF) held in New Delhi on July 12–13, 2016. The IPF, sponsored and organised by NCAER, invites both original empirical research and policy-focused expert reviews that define the best policy advice based on robust, empirical research. Papers appear in the annual IPF Volume after revisions based on IPF discussants’ comments, a lively floor discussion, and the editorial guidance provided by the IPF editors. The 2016 IPF Lecture was delivered by Dr Arvind Subramanian, Chief Economic Advisor to the Government of India. Subramanian spoke on “India and the Global Economy Post-Brexit.” The 2016 IPF featured a Policy Roundtable on “The Challenge of Skilling India for Global competitive”, moderated by Dr Shekhar Shah, Director-General, NCAER had Jayant Krishna from the National Skill Development Corporation, John Blomquist from the World Bank, Bornali Bhandari, NCAER and Karthik Muralidharan, University of California as the panellists. India’s National Rural Employment Guarantee Scheme: What Do We Really Know about the World’s Largest Workfare Program? The IPF 2016|17 Volume is available at the 'Download' link below. The complete set of IPF Volumes, can be viewed and downloaded here.